EWTN 2015 Radio Conference! View. Learn. Engage. Volunteer. KHRM has reached a historic milestone of 3000 hours of continuous programming on 94.1 FM. Come celebrate the Feast of St. Joseph, Patron of the Archdiocese, at this fundraiser to get Anchorage’s new Catholic radio station, 94.1 FM, on the air! Join KHRM in proclaiming the truths of the Catholic Church with listener-supported radio in Anchorage, strengthen Catholics’ faith and act as a voice and resource for Catholic values and moral stands on public issues. KHRM volunteers are valued, trained and recognized. The effect Catholic Radio has on its listeners is powerful! 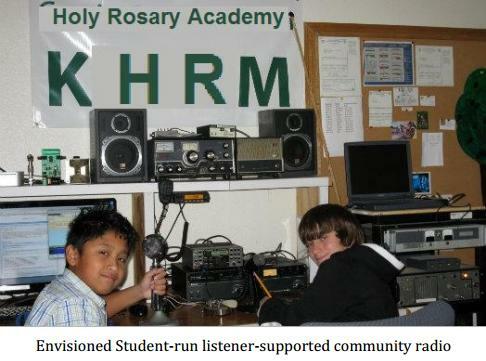 In 2010 over 3,500 Catholic Radio listeners were polled about how Catholic Radio has impacted them. As you read the statistics, imagine the change Catholic Radio could bring to Anchorage! 63% say I am better equipped to pass on the Catholic faith to my kids. The FCC awarded us a license to broadcast on 94.1Mhz FM. Now we’re cooking and will need your interest. What’s next! Brian will be presenting at the Ministry Fair for Holy Family Cathedral in Anchorage AK after masses on the Saturday and Sunday September 13 and 14. Stop by, say hello, take a hand out and tell us what you’d like to hear.